Canada's most dynamic cities are attracting talent and money, driving up house prices. Canada, BC, Vancouver. Aerial view of downtown Vancouver at dusk. False Creek in foreground. The Economist magazine has been saying for years that Canadian houses are overvalued. Its latest outlook offers the largest estimate yet: Houses in Canada, it says, are about 40 per cent too pricey, relative to “fair value,” or what people can afford. But this time, the magazine’s latest global housing outlook offers an explanation for why Toronto and Vancouver, in particular, have seen runaway house price growth in recent years, while other Canadian markets have stagnated or even seen falling prices. In Europe's major capitals, house prices are growing at twice the rate of national averages. In Canada, this is translating into an ever larger concentration of jobs, and people of home-buying age, in Toronto and Vancouver, even as the economy in many other parts of the country stagnates. “The working age population is growing about 70 per cent faster than the national average in Vancouver and Toronto,” National Bank economist Stefane Marion noted this week. 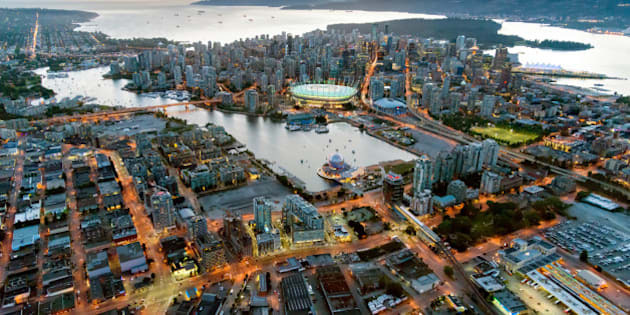 These two cities now account for an enormous share of Canada’s economic growth. While nationwide job growth amounted to 0.9 per cent over the past year, Toronto added 5.5 per cent new jobs and Vancouver added 4.4 per cent new jobs, Marion noted. This same pattern can be seen worldwide. As the average house price in Canada passed the half-million-dollar mark last month, British house prices topped the GBP200,000 (C$370,000) mark for the first time. Thanks to London's popularity among billionaire home buyers, prices in southern England are now twice as high as in northern England. “Between 2002 and 2012 the typical London home sold for seven times the city’s average annual salary. That figure has since risen to 12 times,” The Economist noted. But living in one of these “globalized cities,” as The Economist calls them, is no guarantee that the price of your home will go up forever. Globalized cities can, and do, see house-price crashes. 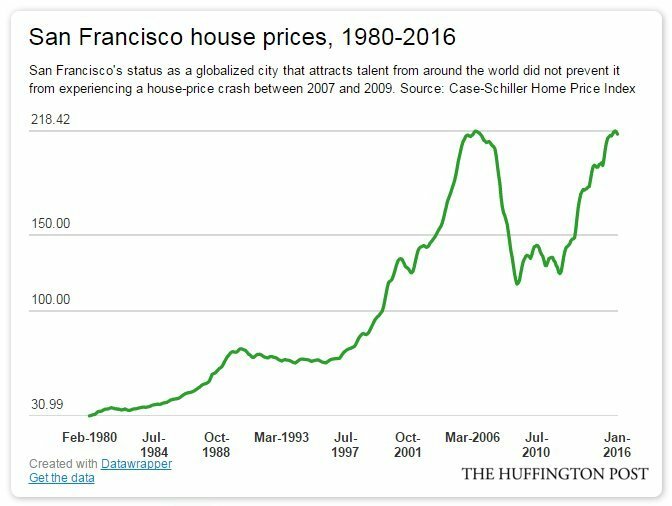 Silicon Valley’s tech boom didn’t stop San Francisco house prices from falling 43 per cent from 2007 to 2009. London was already the world’s favourite place for the wealthy to buy homes in 2008, when its house prices fell by 15 per cent in a year. “As property developers from Las Vegas to Limerick will attest, when supply does eventually respond to soaring demand, property prices fall,” The Economist notes.